FREE DELIVERY. Most firewood, similar to wet laundry, won't cure properly and will turn moldy if it isn't sealed properly. Our fireood rack covers are designed to keep the firewood dry, AND promote curing to make the wood burn more efficiently and cleaner, while reducing mold and mildew. All of our firewood racks come with firewood rack covers. AS SEEN ON NATIONAL TV! Also in Log home Living , Log home Illustrated, and Cabin Life Magazines! Our Firewood racks are rated the best Firewood racks on the internet. THESE DURABLE FIREWOOD RACKS AND FIREWOOD RACK COVERS ARE BUILT FOR STRENGTH AND QUALITY! The shipping weight of our firewood racks PROVE that this is a top quality product. Take a look at the shipping weight of our firewood racks! When you purchase one of these firewood racks you are buying much more than a "nice picture" or a "fancy label", you are purchasing your LAST Firewood Rack. 1. Our firewood racks are simple to assemble! 2. Our Firewood racks are Arc welded end sections, try finding another rack this strong! 3. Our Firewood racks are Black, baked on powder coat finish, the best finish and enviromentally friendly. 5. Our Firewood racks are Factory installed ribbed tubing caps on all exposed ends, guaranted to stay in place. 6. Our Firewood racks are Proudly made in the U.S.A.
7. Our Firewood racks are IN STOCK for immediate shipment, average time to recieve your order is 4 days! All firewood racks are shipped via UPS. 8. Our own firewood rack cover design, covers the top 12" of the wood, and automatically adjusts for the amount of wood in the firewood rack. This keeps the firewood dry, while allowing for airflow through the rack reducing mold and fungus growth. Other units advertise "Mildew Resistant Cover" The Cover may not mildew, but the Firewood can!!!! 9. 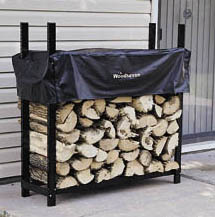 Every firewood rack includes the firewood rack cover! Our firewood rack covers are simply made out of the very best material and with the best design available just like the firewood racks are, a very heavy material made to last for years!